Filariasis, another disease spread by mosquitoes, is a greater problem in southern India than in the north. In extreme cases, it is marked by swelling of the feet known as elephantiasis. From 1981 to 1986, the vcrc achieved filariasis control in Pondicherry just by improving the town's environmental sanitation. But there is nobody in the present state health department to recall this. No follow-up work was done by the state government. The vcrc has been reduced to a mere monitoring body. Pondicherry is replete with breeding grounds for mosquitoes. An area of only 60 sq km in the city has 100,000 sq metres of cisterns and cess pools, 75,000 sq metres of drains, 5,000 sq metres of cess pits, apart from 4,000 wells. Six major canals, 10 km in length, carry sludge from the town. Because of the slope, some of these canals become large swamps of highly polluted water at the point where they join the sea. In addition, there are 80-90 km of feeder drains in which water stagnates because of lack of de-silting and de-weeding. Consequently, the city breeds nine million mosquitoes every January, according to the vcrc . From 1983 to 1985, the vcrc toiled relentlessly to clean the city's water and sewer systems. Sea water was used to flush 50 km of previously clogged drains, destroying mosquito eggs. Stagnant water pools were filled and fish were let loose in open wells to feed on insects. The largest breeding ground, a 200-hectare swamp, was reclaimed, afforested and turned into a public park. Results were astounding: less than one per cent of the mosquitoes survived. According to P K Rajagopalan, former director, vcrc , the centre had effectively managed the sanitation and environment in close cooperation with the municipal, health and town planning authorities. When vcrc handed over the filariasis control project to the state government in 1986, it passed on the Rs 800,000-grant too, Rajagopalan recalls. "Nobody knows where the money was given. But their priority was not mosquito control. They diverted the money to recruit new staff, for other purposes," he explains. What was lacking, according to Rajagopalan, was willpower to complete the time-bound job. The staff strength was considerably reduced. Rajagopalan also blames political interference. But he denies the presence of a pesticide lobby that was pushing the city towards pesticides. P K Das, director, vcrc , also blames the governmental system that stands in the way of effective implementation of bioenvironmental measures. "I declare that the increase in incidence of filariasis or malaria is not due to the absence of tools or lack of technology. It is purely because of workers' resistance to work. Nobody wants to work in the field. I am sorry to say this," he complains. Rajagopalan says that way back in the 1980s, vcrc officials found that they gained the trust of the public if they patiently listened to their woes -- even those not affected by mosquitoes. The complaints from the public were promptly referred to the state government officials and agencies for follow-up. Besides, people were urged to destroy mosquito breeding within their houses by means of posters depicting popular mythological stories and bill-boards. Unfortunately, no figures are available for the pre-1985 scenario to compare the impact of the project, and thereafter at the state level now. The situation of filariasis is sufficiently alarming, according to the records of the nmep . Some 10,000 chronic cases of filariasis and an additional 30,000 cases of micro filariasis were detected annually by the nmep between 1991 and 1994. The numbers of cases will be much more as the nmep 's surveillance system is poor. With a steep rise in filariasis, indifference on part on the state government and lack of funds to carry on with bioenvironmental programmes, vcrc has reverted to drug-oriented programmes. "This they do, knowing well that indiscriminate use of drugs will precipitate resistance," says Das. Rise in malaria cases has been a matter of great concern in Chennai. According to studies conducted by the mrc , the total number of malaria cases rose from 41,822 cases in 1995 to 45,930 in 1996. What is alarming is that cerebral malaria, an acute form of the disease which is a major killer, has registered a rise of 43 per cent during the same period. About 70 per cent of malarial infection has been found in the central business area of the city. Roughly 2.2 lakh breeding sources contribute to mosquitoes in the city. According to a study conducted in 1996 by the health department of the Chennai Corporation ( cc ), 71 per cent of the water sources in the State Housing Board buildings are not protected from mosquito breeding. However, 1997 looked different. According to health officials, cc 's seven-point programme indeed played a role in keeping malaria under control in 1997. One encouraging aspect of the plan is the introduction of bye-laws on construction projects, under which new constructions will only be permitted after health clearance is obtained from the Chennai Metropolitan Development Authority. It is compulsory for owners to deposit the expenditure to cc 's health department, which would be used for undertaking anti-mosquito measures in their premises. No building plan will be cleared if it does not fulfil the conditions specified in the Public Health Act. However, it remains to be seen if this approach proves successful over the long term. Moreover, Chennai would do well to educate its doctors on the treatment of malaria. In 1996, a study conducted by the mrc and the cc showed that the National Drug Policy relating to malaria is not understood by the city's medical fraternity. About nine per cent of the doctors felt that this disease is "rare," while as many as 21 per cent of the doctors did not know that primaquine should not be administered to pregnant women. Moreover, five per cent of the doctors said blood could be donated by malaria patients. While the industrial complex of the Bharat Heavy Electricals Limited ( bhel ) boasts of lower incidence of malaria due to the efforts of the civil maintenance department of the bhel and the mrc , the Hardwar city continues in its battle against mosquitoes. In 1986, the mrc started bioenvironmental control within the bhel complex, an area covering 25 sq km. bhel is a huge public sector company with a centrally-managed residential colony and a team of paid staff. The bhel hospital registered 1,129, 1,623 and 3,049 malaria positive cases in 1983, 1984 and 1985, respectively. Previous mosquito control measures, like spraying of ddt and hexachloro cyclo hexane ( hch ), had very little impact on the increasing trends of malaria, partly due to vector resistance and irregular spraying, which also led to alarming levels of pollution in Hardwar. Work on reducing breeding grounds was undertaken by the mrc in collaboration with the civil maintenance department of bhel . People were involved in establishing nurseries, tree plantations and improvement of toilets, which had an impact on mosquito breeding. However, the community did not take any initiative on its own. It participated only when the mrc took the initiative. "As long as the disease is there, people treat us like gods. The moment it is controlled, they lose interest," bemoans V K Dua, station in-charge, mrc , Hardwar. The programme was continued aggressively for four years, that is till 1990. Thereafter, the focus of mrc shifted to maintenance of the interventions and regular surveillance. "We have instructed the civil maintenance department of the bhel complex to carry it forward. Ours is a research organisation. Our job is only to develop strategies. Carrying it forward is the government's job. Why should we waste our resources in doing someone else's job?" asks Dua. "Now we only work as a monitoring body," he points out. The mrc monitors the entire campus every fortnight, mainly through surveillance. Whenever needed, it arranges through bhel 's civil maintenance department to make minor interventions such as filling pits, ditches and introducing larvivorous fish. The exercise has produced good results. In the bhel complex, incidence of malaria was reduced by more than 90 per cent in 10 years. In addition to bringing down malaria, the level of pesticide pollution in the bhel complex was found to be much lower than in the adjoining areas. A 1994 mrc study in Hardwar found that the concentrations of hch and ddt in soil, drinking water and human blood were 10 to 200 times higher in the nearby locality of Bahadrabad, where insecticides are sprayed, than in the bhel complex where pesticides have not been used since 1986. Considering the toxic effect of pesticides, bioenvironmental control has a distinct advantage over methods such as spraying. Local residents have been able to feel the difference in terms of the decrease in incidence. Shalini Dutta, a physician who has been handling cases of malaria for 20 years, says: "The mrc has done a very good job. The annual incidence of malaria has decreased substantially." Although a decrease in incidence of malaria is acknowledged unanimously, the mosquito nuisance remains. This paradox raises a question: if the mosquitoes remain, would malaria make a comeback and undo everything that the mrc has achieved so painstakingly? "It poses no threat of resurgence as most of the mosquitoes are of the Culex species and do not carry malaria parasites," claims Sharma of the mrc . But how is that despite cleaner sanitation, mosquitoes still preponderate in the campus? "The bhel complex is clean but the surrounding areas are not. These mosquitoes have a tremendous flight range (up to 2-3 km) and due to their import from the adjoining dirtier areas, people still face problems," explains S P Sethi, a technical assistant with mrc , Hardwar. Is the adjoining area of bhel dirty? "The sanitation condition of the town is bad," agrees Y S Bisht, district malaria officer, Hardwar General Hospital. "Even our surveillance system is faulty," he adds. But then what is the use of carrying out bioenvironmental vector control in a selected area and leaving the surrounding areas filthy? To protect the bhel campus from mosquitoes -- both malariogenic and otherwise -- the mrc should have considered a larger concentric area outside the complex. But then if that is the case, how big should the concentric area be? According to Sharma, the issue raises crucial questions on the modus operandi of biocontrol. "We had carried out such a study in Delhi way back in 1974 where we had constructed barriers in an extra three km concentric area (maximum flight range for mosquitoes) to examine the feasibility of such a hypothesis. But it was observed that a three km barrier is ineffective in halting infiltration. Instead, one would have to consider a zone of 15 km or more to protect an area from infiltration," he adds. With great vigour, the mrc took up the first bioenvironmental programme in 1983 in the Nadiad taluka in district Kheda, central Gujarat. For five years, its staff toiled relentlessly in this area to eliminate breeding sources without the use of chemicals. The project ended in 1989. "We wound up in 1989 because this icmr project did not receive extension," says R S Yadav, station in-charge, mrc , Kheda. Subsequently, the state government has been following orders from the nmep and has made no effort to continue the good work. Kheda has moved back to the pesticide regime. A P Pandya, regional director, nmep , Ahmedabad, confirms: "In the absence of bioenvironmental management strategies, the areas were brought back under the pesticide regime". "Kheda is a potential site for the malaria epidemic because of the influence of factors that have resulted from ecological changes in the district," adds Yadav. With the onset of canal irrigation, several factors such as continuous irrigation, multiple cropping patterns, increased waterlogging due to seepage from canals and the lack of proper and adequate drainage have resulted in the alarming rise in the incidence of malaria. In the early 1980s, district Kheda had a very high incidence of malaria. The annual parasite index ( api , which is derived by dividing the number of malaria cases by the population) shot up to 28 in 1981, about seven times higher than the corresponding national average of 4.1. The problem of mosquito resistance had become a matter of great concern as chemicals had been indiscriminately sprayed over the past years. In Nadiad, one of the ten sub-divisions of district Kheda, the incidence of malaria before 1983 had been consistently the highest compared to the rest of the district. "A massive outbreak of the disease in Bamroli, one of the 100 villages of the Nadiad sub-division, occurred in 1981. The disease was in epidemic proportion, killing over 100 people and affecting a few thousands," recalls Yadav. The project was initiated in seven villages. In May 1985, it was enlarged to cover the entire Nadiad taluka. 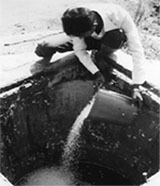 From 1983 to 1989, an intervention team comprising of experts in entomology, supporting staff, daily-wage workers and voluntary labourers under the technical guidance of the mrc took up activities such as filling and levelling of low-lying areas with earth, drainage of water collection from smaller water bodies and construction of soakage pits for structured drainage. Open intra-domestic containers were covered and fishes introduced in village ponds. Health camps and exhibitions were organised and women and children were mobilised. "The chain of sustained activities greatly helped in generating confidence among the people," believes Yadav. S Haq, mrc 's expert on fisheries, helped to create fish hatcheries in village ponds. Within a few years, 94 hatcheries were established and maintained by mrc staff with the aim of having a hatchery in every village so that fish could be made available easily to villagers. Edible and larvivorous fishes were farmed in eight ponds that were otherwise infested with water hyacinth. This not only helped to control mosquito breeding but even improved the village economy as the money generated went to the village panchayats, which, in turn, spent it on development activities such as laying down underground drainage. Four of the eight ponds yielded about 10 tonnes of fish worth about Rs 100,000. Incidence of malaria in the project areas was consistently lower than in areas where spraying of chemicals continued. "The difference shown is an underestimation. This would have been more pronounced if the frequency of surveillance was the same in the non-project areas," comments R M Bhatt, entomologist with mrc , Kheda. According to Bhatt, the non-project areas were under fortnightly surveillance under the nmep , as compared to weekly surveillance in the project areas under the mrc . As the malaria parasite has a 10-12-day cycle in the host, the parasite may not have been detected in the fortnightly surveillance. In 1989, the project on alternative vector control was ended in Nadiad. The mrc exhausted its research grant. Lots of people including daily-wage workers and surveillance workers lost their jobs. A visit to Kheda now reveals a shocking scenario. Villages have reverted to the pre-project stage. No efforts are being made to reduce breeding sources. There is no attempt to carry forward the work done by the mrc . Hatcheries reveal blooms of water hyacinth. nmep 's data shows that alarming levels of ddt were being used in Kheda after the mrc projects were phased out. mrc 's scientists demonstrated a dramatic fall in malaria incidence just by applying larvivorous fishes in water bodies in Kolar, Karnataka. After six years of innovative work in Kolar, the mrc is continuing its efforts, wondering what will happen after they wind up operations. "State officials are excited and happy about our work, but it is difficult to say if they will continue it," says V P Sharma. In 1992-93, work was started in Kamasundaram in district Kolar. At that time, Kolar accounted for 45 per cent of the total malaria incidence in the state. Health officials are quick to put the blame on inadequate ddt spraying. As Kolar has been providing silkworms for the state's silk industry, farmers have resisted ddt spraying due to its adverse impact on silkworms. But mrc scientists believe that migratory labourers from Tamil Nadu and Andhra Pradesh, who come to work in the silk farms, were the carriers of the disease. Fish farmers cooperated with the mrc in its efforts as bioenvironmental control posed no hindrance to their livelihood. Ameen Ahmed, a fish farmer in Ratenahalli village, harvested 10 tonnes of Katla , a species of edible river fish, from his tank. The drop in malaria cases was steep. In the 93 villages under the experiment, incidence of malaria dropped from 1,446 cases in 1993 to 381 cases in 1995. Bioenvironmental methods were also cheap. According to S K Ghosh, malariologist and principal investigator of mrc , Bangalore, in charge of the mrc team in Kolar, the total cost has worked out to Rs 1 per head, excluding the salaries of the staff. The state health department is yet to work out corresponding costs for spraying, but the difference is estimated to be phenomenal. The cost of spraying homes works out to Rs 150-200 each. Despite the good work, education of local communities on biocontrol methods is still lacking. No efforts have been made by either the state health officials or the scientists to educate local farmers. B S Paresh Kumar, reader at the department of sociology, Mysore University, and volunteer social scientist at the Community Health Cell, a non-governmental organisation, feels that by including social scientists in malaria research teams countrywide, the problem can be tackled at different levels. Ghosh, however, feels a scientific experiment of this nature needs to be proved before it includes the community because negative results would result in misinformation, which would be more damaging. The Banavara primary health centre ( phc ) in district Hassan, Karnataka, recorded 8,028 malaria cases in 1995. Reason: the high percentage of migrant labourers from Andhra Pradesh who work as stone cutters in the Chikkur railway line conversion project. In 1995, the mrc expanded its work in Kanakatte and Banavara phc s. Hassan is relatively well-off in economic terms. Its coconut farmers have a good income and are both aware and educated. Yet the incidence of malaria is severe, with the mrc team pinpointing the major source as disused wells and migrant labourers. "Health is a totally neglected sector in today's government policies," says Ghosh of mrc , Bangalore. "The government has not understood that liberalisation and progress of the state cannot be undertaken without proper health measures," he indicates. Helpless about the situation regarding migratory labour, the mrc team attempted to get rid of mosquitoes by applying alternative methods of control in the waterbodies. Beginning with Kanakatte's 52 villages in January 1996, fishes were introduced in 38 villages, a combination of fishes and impregnated bednets in seven villages and only bednets in seven additional villages. Within a year, malaria cases declined conclusively. As a result of introducing fishes in all 108 villages in Banavara, the monthly parasite index dropped from 38.5 per cent in 1995 to 8.6 per cent in 1996 and further to 1.5 in 1997. Of the 108 villages, 10 were selected for their numerous waterbodies to be taken under the "fish and biocide" scheme. Biocide trials began in January 1997. Ghosh feels it is premature to make any statement on this trial yet. So what will happen once the mrc phases out the bioenvironmental control methods from Kolar and Hassan districts? Ghosh fears that the 10 people trained by the mrc, Bangalore, in all aspects of malaria control will either lose their jobs or will be put into other departments where their expertise will get dissipated. What happens in Hassan needs to be seen. Clearly, the fate of bioenvironmental control rests wholly on the initiative of state health officials. What do the field experiences tell us? Firstly, bioenvironmental management can be a working alternative to contain malaria. The science of the methodology is sound. Secondly, the efforts of the mrc and the vcrc proved to be successful in the short term but failed in the long term due to severe inability of the state governments' institutional set up to create community-based institutions to carry forward the pioneering work. In Hardwar, efforts to keep up with environmental sanitation did not fail completely in the long run, only because the infrastructural facilities of a huge public sector company were available after the mrc phased out its project. The situation in Goa is certainly dispiriting. The future may not be so bleak in Chennai if the recently introduced bye-laws for new constructions are seriously implemented. Kheda's case is especially sad considering that it was the place where the philosophy of bioenvironmental management was first tried out. State officials in Kheda are waiting for funds from the World Bank instead of applying their minds to how to develop a community-based initiative to continue the good work. Finally, the fate of bioenvironmental management in Kolar and Hassan hangs in the balance. Much would depend on whether the state government will continue mrc 's work. In should be noted that there are several good cases in India where voluntary agencies have set up effective institutions at the village-level to improve and maintain the natural resource base of the village. State governments can learn from these examples. The village of Sukhomajri near Chandigarh is a good example where a village-level institution called the Hill Resources Management Society, consisting of one member of each household, was set up to mobilise the villagers to take control of their environment. The concept of Pani Panchayats in Pune, another village institution comprising landless labourers, marginal farmers and dalits , took control of the distribution of water in the drought-prone area. The person who led the largest mass movement involving people from various parts of the country in modern India, Mahatma Gandhi, had once said: "If there is no people's participation, no amount of government effort, no amount of science and technology will produce the desired result." Gandhiji's words are quite relevant to those involved in fighting mosquito-borne diseases, since environmental sanitation is essential to the containment of the disease, and people's participation is necessary for environmental sanitation. If we want to eradicate malaria, serious government efforts have to be made to educate people about ways to maintain the environment, and to encourage innovations when present technology is found ineffective. Written by Priti Kumar with Raj Kishore Khaware (Kheda and Hardwar), Frederick Noronha (Goa), Keya Acharya (Kolar and Hassan) and S Vishwanathan (Pondicherry and Chennai).